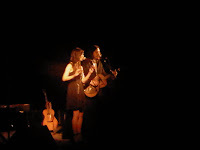 The Civil Wars announced they were going to sing a cover song in which many will recognize part of the song but may not know the sad and mostly unsung verses. I turned to my friend and said, "They are going to sing You are My Sunshine" and that's exactly what they did. While the opening band Parlor Hawk sang, I looked to my right and noticed the guy next to me was wearing a bow tie. I did a double take and realized it was John Paul, member of The Civil Wars. Oh happy day. I smiled during the entire concert as I listened to The Civil Wars share their incredible talent with those in attendance. I may have even turned to my friend and announced that I must be in a band. I may not have been kidding. I fully support this decision. I will bring my tambourine!